Our malt bill consists of a complex blend Weyerman Pilsen, Vienna, Rye, and spelt for a golden color yet vinous body. Pumpkin was added in the boil for the smooth textures dancing over the palate. Several varieties of whole peppercorns were added to the boil to further reinforce the expected spiciness of this Saison. In fermentation, we mixed 5 distinct yeasts creating a spicy and fruity ester profile. Post fermentation the batch will age on American Oak Chardonnay barrels, 6 varieties of Bretta, and the rare fruit known as Buddha’s Hand. Expected ABV is 12%. (Buddha’s Hand was also added to the boil). If you want more information on this beer, there is hours worth of information online about it at this point. Jason Yester took a lot of video from the event, so check his video-blog page to see the activities. Additionally, Rockyard Brewing set up a blog page devoted to this collaborative beer, which includes a wonderful entry of the email exchange happening between the brewers. Check it out! This is what a Buddha’s Hand looks like. Pretty friendly looking fruit, eh? Jason Yester, Jason Leeman of Rock Bottom COS, and Tim Myers of Strange Brewing checking mash temperatures. 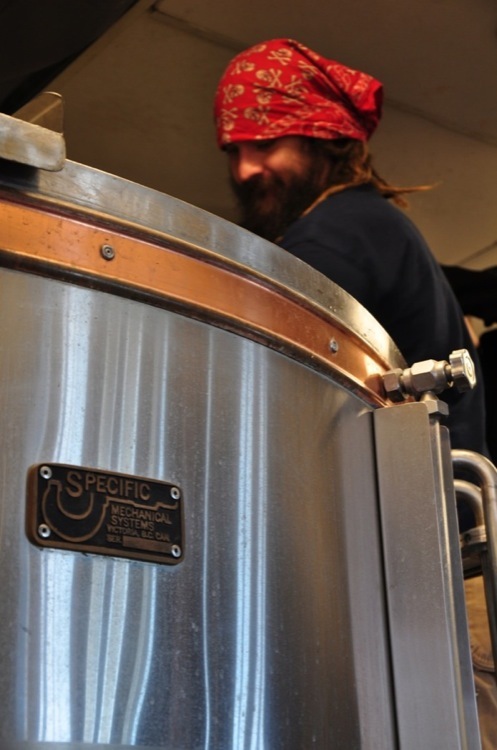 Jim Stinson of Rockyard Brewing checking to see if the mashing procedure had finished extracting sugars from the malt. They were shooting for 16-18 degrees Plato. John Vinson of Trinity Brewing and Thomas Larsen of Ska Brewing getting some fresh air. We grated a pound or two’s worth of the Buddha’s Hand to put into the boiling wort. More will be added during the aging process. Tim Myers of Strange Brewing is smelling some Buddha’s Hand. The aromatics and flavor are much subtler than I figured they would be. Citrus notes are definitely prevalent, sourness isn’t really there though, it’s more of a sweetness. The aroma wasn’t as room-fillingly pungeant as an orange. John Schneider of Black Fox Brewing and John Vinson adding a ton of pumpkin. The pumpkin is being used less for flavor than for a texture and mouthfeel not too unlike the texture oats give to a stout. Checking out the boiling wort. Troy Casey of AC Golden/Coors brought a couple strains of Brettanomyces Yeast for the beer. The strains were cultivated at the AC Golden Brewery, one from a bottle of Cantillon and the other from a bottle of Drie Fonteinen. Jason Leeman sharing some of his Pirate Beer, an English IPA aged in Leopold Brothers Rum Barrels. The beer will be available at Rock Bottom on Sept. 19th for national Talk Like A Pirate Day. Isaac Grindeland on the left, who was helping photograph the brew day, is talking with Gordon Schuck of Funkwerks Brewing. I’m really hoping we’ll see some Funkwerks in Colorado Springs someday very soon. Jason opened some nice bottles of Trinity beer. Here he’s pouring some Pappy Legba, which has a pinkish-orange color, is a light-sour cherry saison and aged in oak barrels. The beer will be aged in the barrels on the right. It will then be bottled and every participating brewery will be listed on the label. This picture shows Chad Yakobson talking with Troy Casey about storage of barrels and the different types of storage racks available. Checking the gravity of the beer, seeing how much potential alcohol content to expect. One keg was filled with the Buddha Nuvo. The keg will will be offered at an upcoming festival and will be the only non-oak aged version of the beer available. There were many other brewers that took part in the making of this beer, but somehow I have managed to not have photos of everyone. I apologize to those brewers. Included in the list, but not limited to these folks, are Joe Fox of Del Norte brewing, Christian Koch from Tommyknocker Brewery, David Lin of Dry Dock Brewing, Jason Buehler of Shamrock Brewing, and Andrew Bradley of Colorado Mountain Brewery. * Indicates an image photographed by Isaac Grindeland. You can get email updates from Focus on the Beer here and join us on Facebook here.